It’s not often that someone is able to write a (successful) novel and then both write and direct a film adaptation of that work, but that’s exactly what Stephen Chbosky did with The Perks of Being a Wallflower. The popular young-adult novel was published in 1999, and after taking on such projects as writing the screenplay for Rent and co-creating the CBS show, Jericho, Chbosky went back to his roots and brought us this adaptation. The film follows the life of an insecure, shy 14-year-old named Charlie (Logan Lerman), who has suffered a series of traumatic events in his childhood. Now emotionally scarred, Charlie is anxious about entering high school, and he struggles to make friends (outside of his English teacher, played by Paul Rudd). Eventually, he finds solace in the form of two eccentric seniors: Sam (Emma Watson) and her stepbrother Patrick (Ezra Miller). They introduce him to new music (i.e. The Smiths, a staple of this type of film) and invite him to hang out with their group of friends, who they lovingly dub “The Island of Misfit Toys.” This includes a Buddhist punk (Mae Whitman), a blonde goth (Erin Wilhelmi) and a brownie-loving stoner (Adam Hagenbuch). Charlie fits right in with the group, and they help give him the type of friendship he so desperately needs. At its core, this is a basic coming-of-age story, but Chbosky places a greater emphasis on emotions and the feeling of alienation. Everyone in Charlie’s newfound group of friends is alienated in some fashion. Sam has self esteem issues, and she has a habit of turning to older men for acceptance. Patrick is openly gay but is in an awkward secretive relationship with a jock who is afraid to come out. Charlie himself has been in-and-out of mental hospitals due to prior traumatic experiences. In a way, it seems the only thing keeping these kids going is each other. Anyone who ever felt this way as an adolescent (and really, who hasn’t?) will be able to empathize with these characters. Since Chbosky wrote and directed his own work, he was able to present this in his total vision. The writing is sharp and witty, and the dialogue is delivered perfectly by an undeniably strong cast of up-and-coming talent. Folks, keep an eye on the trio of Logan Lerman, Emma Watson and Ezra Miller. These three have fantastic chemistry together in this film, and as individual performances, all of them impress. It’s great to see Watson step out after the Harry Potter series, and Miller builds upon his fantastic take as the demonic Kevin in We Need to Talk About Kevin. But best of all — and most surprising — is Lerman in the lead role. I haven’t seen any of his recent work, but he is most impressive in showing Charlie slowly coming out of his shell while still maintaining his emotional scars. My only problems with the film are minor ones. As a high school coming-of-age story, it does rely a bit too much on familiar tropes of the genre (i.e. being cool for liking bands like The Smiths and showing a love of foreign film). There is also one moment that I still can’t wrap my head around. David Bowie’s song “Heroes” plays an integral part of the film, and the characters are all clueless when they hear this song on the radio. How can a group of kids that are so in tune with “underground” music not know one of David Bowie’s biggest hits? Given the importance of the song to plot development, it seems a bit puzzling as to its selection. 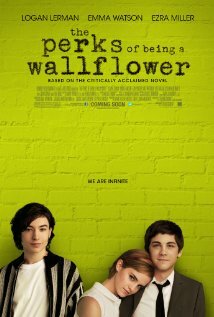 Still, small issues aside, I quite enjoyed The Perks of Being a Wallflower, and I suspect that most will as well. I have never read the novel, but now I would like to, and that doesn’t happen often for me. I keep hearing good things about this. I should check it out. Thanks, Eric. It’s definitely worth checking out, Michael. Hope you enjoy it. I see you changed your profile pic to a THEY LIVE humanoid alien. Good one. For Halloween? His character in this is quite the departure from Kevin, that’s for sure! Between the two films, he has really impressed me. Can’t wait to see what he does next. I thought the same thing about them not knowing “Heroes”. I’ve read some reviews of this but I had no idea Chbosky wrote the novel AND also wrote/directed the film. WOW that is quite a feat that he did a good job with both. I will rent this one for sure. Yeah, you just don’t hear about someone being able to do it all like that very often. Very impressive stuff indeed. I am so glad you liked this one Eric. It is one of my films of the year now!! Great to hear you are a fan as well, Scott! I really enjoyed this movie too… I thought I’d reached the age that high school movies would no longer resonate with me, but I found that I really quite liked all the characters here and empathized with their plights, so I guess an exceptionally GOOD high school themed flick can still grab me. Glad to know I wasn’t the only one annoyed about the Bowie song though… Not having read the book I don’t know if that was the song used there too (or if there was one) although since the author directed, one would have to suppose..
Yeah, the Bowie bit still bugs me, but I did read a good counterpoint over at Public Transportation Snob (ptsnob.com). Things were a lot different before the digital age, and it’s feasible that someone could be totally oblivious to certain artists/songs during that time. I heard that Chbosky himself stated that him and his friends always thought of Bowie as the “Let’s Dance” guy, so I guess it makes sense that the characters weren’t familiar with his earlier work. I still feel it’s a bit off, but at least I get his perspective now.